so this is what it’s like to be an adult. I found some feathers out on the back porch today. Next to the girls’ play kitchen, in the back corner, were three or four black and brown feathers and a little blood. I really didn’t think much about it. I picked up a plastic apple, a pitcher and some plates near the feathers and looked around to see if the victim might still be there, but it wasn’t. I let the dog out and walked back inside. It doesn’t seem that long ago that feathers on the ground would have been something to marvel at, to squat down and touch and pick up and wonder about. First just to feel the softness and discover something new. To hold out, beyond your fingertips, with your hair pushed back and soar through the backyard. To meet face to face with one of the untouchables that seem to live in a very different world than you do. To hear the second-hand story of a death told in your own words. But it was a long time ago. When we concocted this concept of time we did so based on observable patterns of the sun and moon, charting stages, from birth to death, for days and months and years. We learned how our own patterns follow along. We learned of orbits and ellipses and we learned how it all fits into nice, orderly categories. We learned explanations. We learned how we fit into all of this. And we took the sun and the moon out of the sky, put them into our pocket and made them ours. Then, as we have done with all of our new, shiny things, we forgot about them. Until we are shown them again by a new set of eyes and unlearn all we thought we knew. I left the feathers on the porch because I didn’t think about them. I’ve seen feathers before and touched them and know all of their secrets. I’ve stood in front of a cage and looked at the untouchable inside. I’ve heard all the stories of death. I left the feathers on the porch because there was no magic in them to me. But they will see it, these new sets of eyes. They will bound around and squeal and tell stories about the feathers. They will ask me a thousand questions about them because they will have a thousand questions about them. They will interrupt every conversation for the next week making sure everyone knows about the feathers on the back porch. They will breathe life into those feathers that I just ignored. And they will watch the sun and the moon move around us. Without names or numbers, they will talk about days and nights. The next birthday will be a celebration of that day rather than a marking of another year passed. As the sun follows them, they will play. As the moons sneaks by, they will sleep. Schedules and appointments will elude them, but moments will be full and short and they will run to each one. And they will wonder how we fit into all of this. They will see the magic and live as if it is the only thing that matters. And I’m not sure that they are wrong. Trying to preserve the wonder of it all is a very hard thing to do. Repetition and reason have a tendency to mute the magic that surrounds us while amplifying the fences and lists and schedules and walls with which we organize ourselves into our little boxes. We grow up and the beauty becomes mundane while we convince ourselves that the mundane is beautiful. Birth and death are everywhere – think of how much of it is happening every second, all around us, among the grass and the flies and the flowers and the birds. We are surrounded by life and we fail to even look. Those feathers never did completely leave me today. I thought about them long after I left them sitting there on the porch because I think I knew that my daughters would see them and they would feel something that I have forgotten how to feel. Maybe I knew that once again their new sets of eyes would have something to show me. I want to marvel at it all – and I even sometimes do – but imagine what they think about all of this. I try hard to remember what it must have been like to know that the sun travels across the sky because it is my friend, but I am an adult and I know we are just completing another rotation. I’ll try again tomorrow. This entry was posted in Uncategorized and tagged daughters, death, feathers, learning, life, magic, moon, sun. Bookmark the permalink. Our children are a gift to us; to give us another opportunity to experience the magic once again. We are lucky if we can let go of our experience and see the magic of it all again, as we did back then and as they do for the first time. We are lucky and indeed blessed for these opportunities. Let go and enjoy. 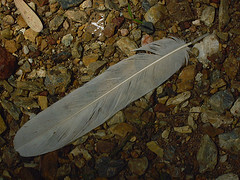 May we never cease to be amazed by the feathers we find, and wonder who, what, where, how, why, and what if…. It is always such a privilege to read your comments, my friend. Thank you. Thank you so much, Alexandra. They are such a wonderful gift (wrapped in a big ol’ ball of frustration). It is great to look at them and realize that I couldn’t be half the man that I am without their presence in my life. I SO remember nighttime car rides when I really believed the moon followed me home! But I had forgotten! Thanks for the reminder– and it’s so true. My 3 year-old has just started w/ the whys about everything, which is already so never-ending, but at the same time so endearing for all that it makes me stop and consider and marvel at, which I would not normally do. And kids are great for this too – “The next birthday will be a celebration of that day rather than a marking of another year passed.” Which is the way all birthdays should be celebrated…if we could just maintain their outlook! Dude, I miss reading your writing. And, it’s partly my fault, as this was written almost two months ago, and I’m just now getting around to reading it. This one was one of your most beautiful and astute pieces I can remember reading. It resonated with me deeply, as I have been thinking along the same lines with my kids. Even though we aren’t as connected with our writing as we were when we started this journey over a year ago, it is a piece like this that remind me that our connection is still there, and that I’m glad that it is. My friend, thank you for this. We don’t get to talk like we did when we started this journey (I can’t imagine how either of us could be too busy), but I always know that connection is still there. I’m glad that it is, too.